You go into your local grocery store and see that some people are getting groceries at a discount compared to what you are getting them at. You are not quite sure what is going on at first until you notice the sign that says that the store will give people who bring in their own bags a discount. Many stores across the United States are now adopting this practice. With plenty of reusable bags out there this method is a great encouragement to get others to step up to the plate and quit using those thin plastic bags or paper bags that are constantly harming the environment. If you use your own reusable bags you can help save those other bags from a life of decay at the landfill. It takes many years for those bags to decay while they release harmful chemicals into the environment. In the past decade our environment has gotten worse and these bags have only contributed to the problem. In using your own reusable bags you will save money, as well as help save the environment. Another great thing about these bags is that they can be reused anywhere you want them to be. You can take them clothing shopping one minute and then later take them to the grocery store. You can even find great reusable bags that have a cool lining in them to help keep foods that need to remain cold, cold. Where Can I Purchase Reusable Bags? There are many different locations where you can purchase bags. In most grocery stores and retail stores they sell their own reusable bags. Just go in the store and you will find very reasonably priced bags within the store. If you want a more unique design to your reusable bag you can go online and purchase designer reusable bags there. 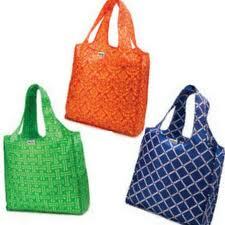 These bags may be a bit more expensive but they are all well worth saving the environment. There are many different types of reusable bags out there. You can find one to fit your needs just about anywhere. Here are a few that you may like to use. The Flip & Tumble Loopt Bag. This bag is washable and reusable. It is also made of a heavy duty plastic that is durable and will last a lifetime. This particular bag can come in many styles. Waste Less Bags A great set of bags that will help you to use reusable bags for all of your shopping needs. Reusable Grocery Bag A simple design with a pack of 10. Strawberry Shopping Bag. This unique bag goes into the shape of a strawberry until use. This bag is resilient and will come in handy when you go shopping. Using reusable bags will help to cut down on your own emissions. You will help save the environment by simply switching over to reusable bags. Going green has never been so easy. Get your reusable shopping bags today and start getting in on those discounts other reusable bag owners are getting today.